This Memorial takes the form of a large plaque in a heavy mahogony picture frame on the wall in Reception in the new Academy. Originally, it must have been in the old Academy. 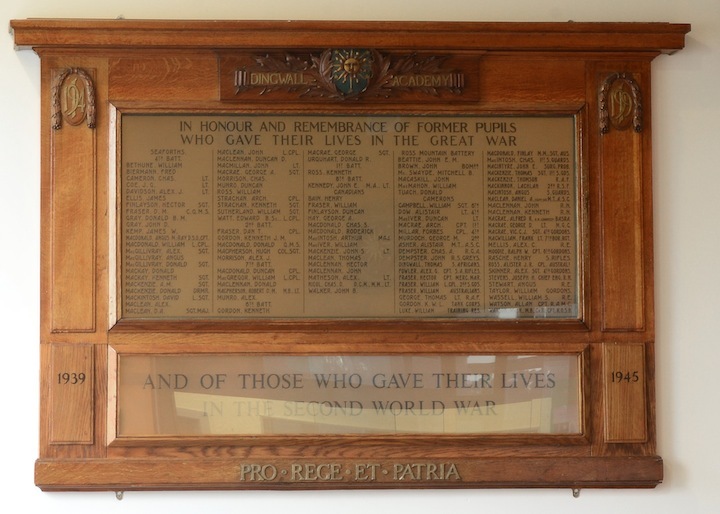 It is a list of former pupils who fell in the Great War 1914-1918. There is no comparable list for World War II. NOTE: Some of the names on these lists may appear on other Memorials. MACDONALD, ANGUS M. RAY. D.S.O. CPT. MACPHERSON, ROBERT D. M. M.B. LT.
KENNEDY, JOHN E. M.A. LT.
FRASER, WIKKIAM L.CPL. 2nd. S.GDS. GORDON, K. W. L. TANK CORPS. MACDONALD, FINLAY MM SGT. AUS. MACINTYRE, JOHN E. SURG. PROB. MACLEAN, DANIEL A. STAFF SGT. M.T. A.S.C. MACRAE, GEORGE D. LT. M.G.C. MACWILLIAM, FRANK LT. 7th BOR.RGT. ROSS, ALISTER J. R. CPL. AUSTRALS. STEVENS, JOSEPH H. CHIEF ENG. R.N. WATSON, Wm. N. M.B. Ch B. CPT K.O.S.B.